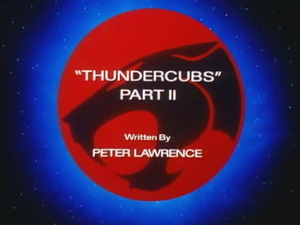 Picking up where the premiere episode ended, “ThunderCubs Part II” begins by serving the viewers with an entrée of action. 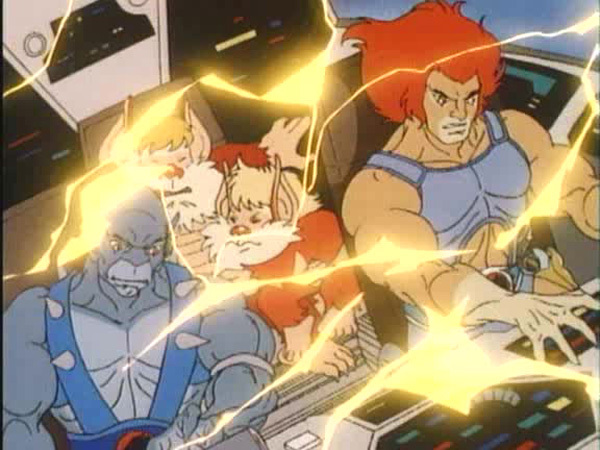 Driving the Thundertank, the ThunderCats are hot on the trail of the Lunataks who have captured Lynx-O and the ThunderKittens in the Luna Tacker. 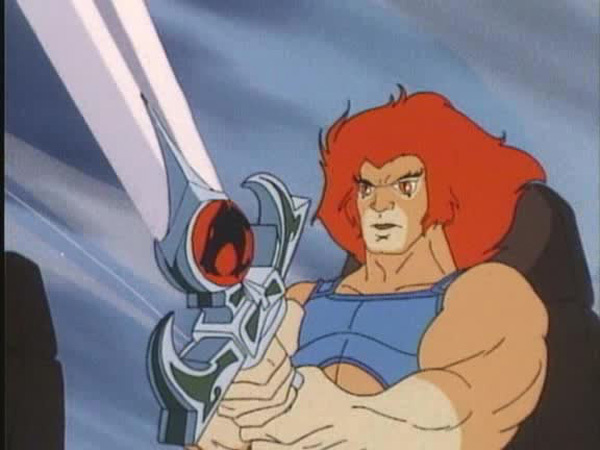 Instead of blasting the villains’ vehicle with the laser cannons and endangering the lives of the hostages, Lion-O opts to use the Sword of Omens to do the job. One blast from the sword freezes the Luna Tacker in its tracks while another shatters it to bits. The ThunderCats then return with their rescued comrades to their fortress while the Lunataks beat a hasty retreat. 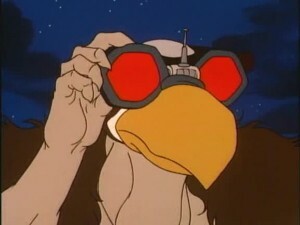 As the episode progresses, more details are revealed about New Thundera. 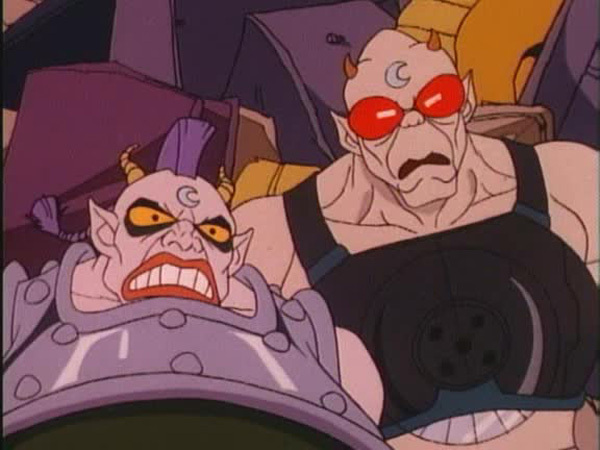 It turns out that certain areas of the incipient planet are strongly influenced by the near orbiting Moons of Plun-Darr, with each moon bestowing its characteristics onto the region. 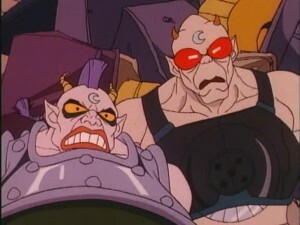 The region known as Mountains of the Moon possesses super strong gravitational pull due to the close proximity of the first Moon of Plun-Darr, the Caverns of Cold are characterized by freezing temperatures thanks to the second moon, and the Jungles of Darkness are thrown into a perpetual blackout due to the third moon. 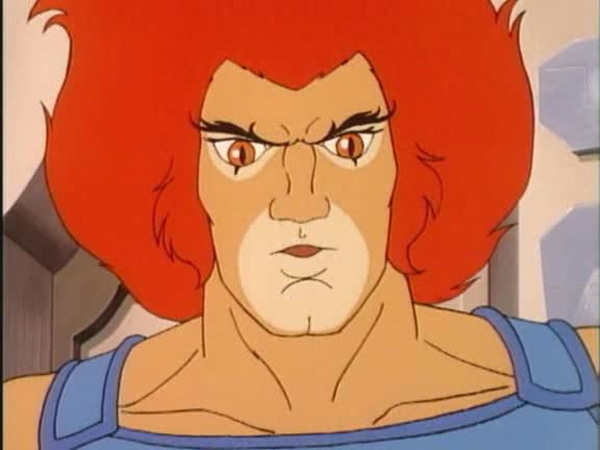 To be able to cope with these severe environmental conditions, the ThunderCats get busy developing new equipment and apparel. Meanwhile Vultureman, who has been quietly observing all the activities of the ThunderCats, plans to throw a wrench into their plans, but first he makes use of that wrench to repair the damaged RatStar. 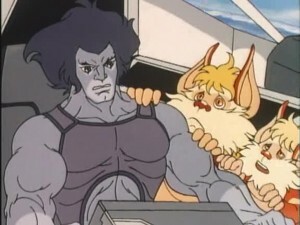 Irritated by Monkian and Jackalman’s mockery, Vultureman takes off in the RatStar alone, not knowing that S-S-Slithe has already stowed away in it. One common element which shines in all of Peter Lawrence’s scripts is his talent for crafting exciting battle scenes, and this episode is no exception. Just as the Feliner takes off from Cats Lair, it is ambushed in mid-air by the RatStar. 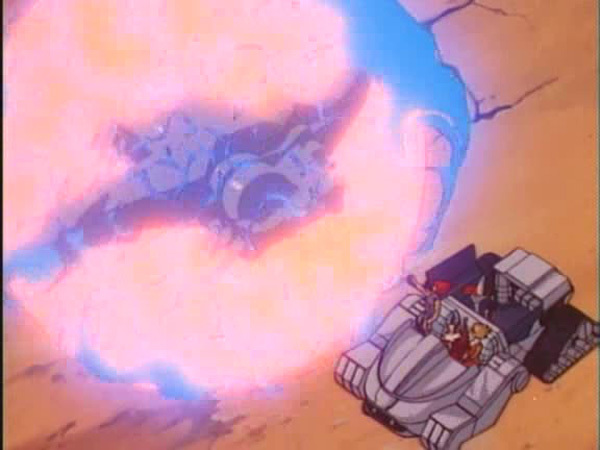 So powerful is the Mutants’ ship that it manages to paralyze the mighty Feliner with one blast from its VariCannon. 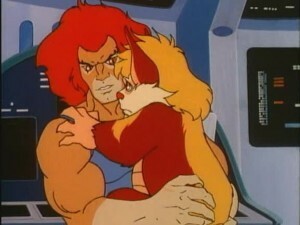 A second blast freezes the Feliner’s occupants in a catatonic state. Surprisingly, Snarf and Snarfer are unaffected and try desperately to wake the others as the Feliner plummets to Third Earth. As a last resort, Snarf puts the Sword of Omens in Lion-O’s hands and it manages to revive him. The young lord then quickly uses the sword to rouse his friends from their stupor. 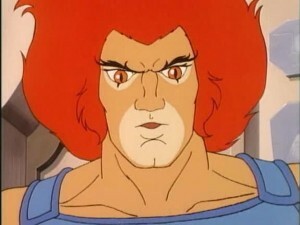 The second round of the fight belongs to the ThunderCats as they shoot down the RatStar and it crashes on Hook Mountain. 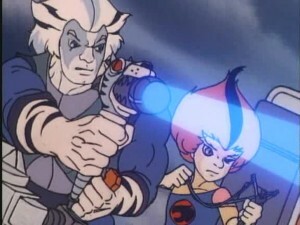 Before the feline heroes can relish their victory, a transmission from Lynx-O informs them of increased levels of volcanic activity on New Thundera, indicating that Mumm-Ra has located the Sword of Plun-Darr. 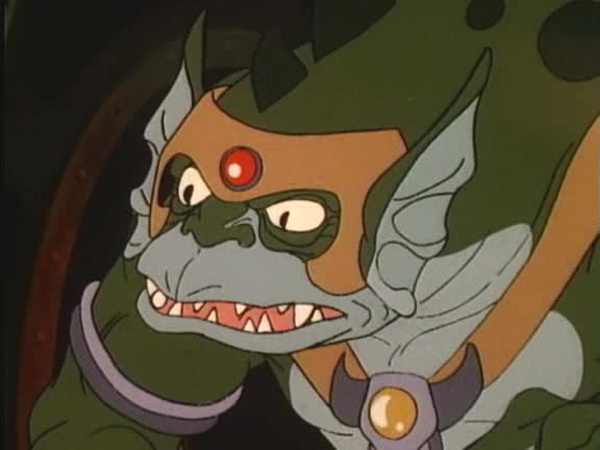 A maniacally cackling Mumm-Ra summons the end of the episode. Tygra mentions that New Thundera is half a Thunderian Eon from Third Earth. It is not known how many of our light years make up a Thunderian Eon. 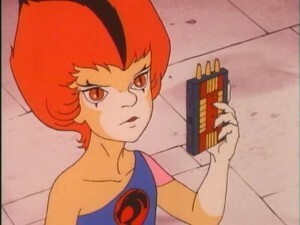 The episode debuts a brand new take-off ramp which the Feliner uses as a runway. 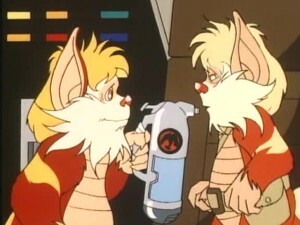 In order to keep warm on the Caverns of Cold, Snarfer cheekily suggests that they wear “Thermal Thunderwear”! The special water bottles with the ThunderCats insignia on them located inside the Feliner are a nice touch by writer Peter Lawrence and typify his attention to detail.